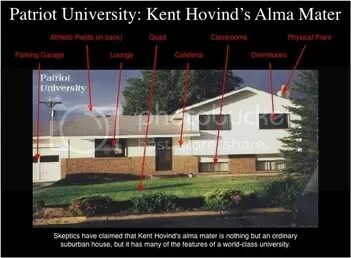 Here’s something interesting I came across recently: Kent Hovind’s doctoral dissertation. His school, Patriot Bible University (with a name like that, it HAS to be good), has claimed that what was leaked is not the complete thesis, which might explain why it’s so short, lacks a bibliography, and refers to chapters that aren’t actually there. It wouldn’t, however, explain why it repeats itself several times in the existing 101 pages, contains very few citations, and constantly cites personal opinion with no support whatsoever. And forget about original research; I’m not sure this even contains any original IDEAS. Not that it really matters, because Patriot is a diploma mill, and they probably would have given the guy a doctorate if he’d submitted his grocery list. 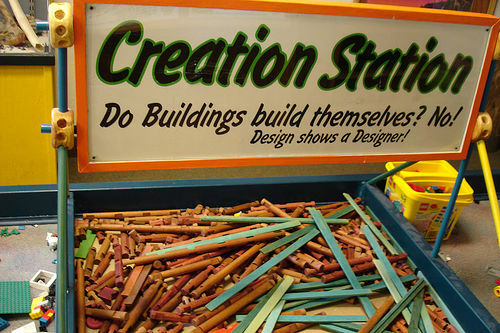 Most of it is made up of pretty typical Young-Earth Creationist arguments, including the insistence that evolution is a religion and out-of-context quoting of scientists to make it sound like they ADMIT evolution is bunk. One of his earliest statements in the dissertation is that evolution can’t work because things can’t get better without outside influence. “Everything tends toward disorder. The first and second laws of thermodynamics are well established scientific laws that have never been observed in the universe to be broken. The first law says that matter cannot be created nor destroyed by ordinary means.” Actually, that’s the law of conservation of mass, and it’s only true in a closed system, which the Earth is not. There’s also the common Creationist straw man argument that evolution means things get better over time, which is a philosophical position, not a scientific one. The scientific theory doesn’t make such value judgments. Then we’re told that evolution is really the desire of humans to become like gods, and was invented by Satan. God hates pride enough for Hovind to use two exclamation points in a row, but it apparently isn’t prideful for him to claim he knows more about biology than people who have studied it their entire lives, or for Creationists to say evolution can’t be true because they aren’t descended from monkeys. There are also constant irrelevant attacks on character: Karl Marx was egotistical, Aldous Huxley did drugs, and Charles Darwin’s grandfather Erasmus had illegitimate children and was fat. 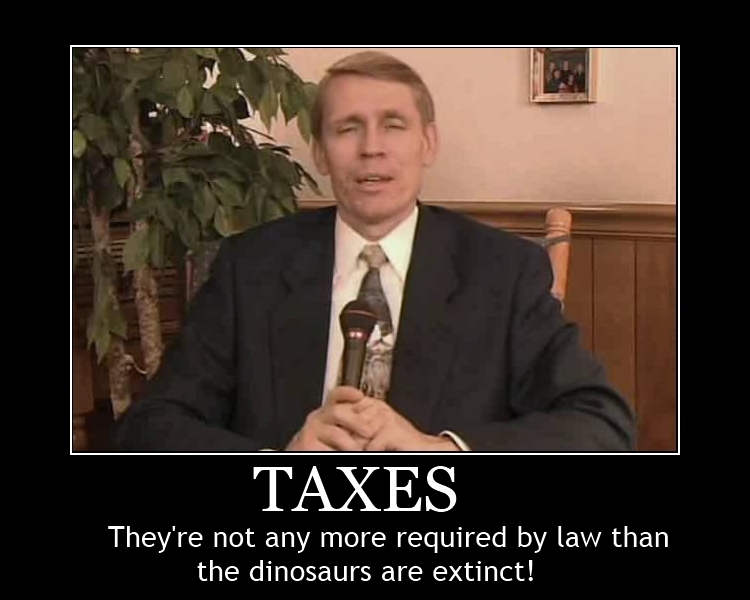 Fortunately, I’m not writing a doctorate thesis, so I can point out that Hovind is in prison for tax evasion. Or maybe this isn’t as unrelated as it might seem, as I understand he used the same sort of dumb, discredited arguments against paying taxes as he did against evolution. Oh, and here’s another gem: “Webster defines a religion as ‘a belief in a divine or super-human power or powers to be obeyed and worshipped as the creator of the universe.’ What created the universe? Was it blind chance, evolution? If so, then blind chance is their creator and they worship chance.” Now if you’ll excuse me, I have to go sacrifice a sheep to randomness. I’m also inclined to think Hovind misquoted the dictionary, but it’s not like I can check. I’d say more, but you might as well go read the thing yourself. This entry was posted in Christianity, Evolution, Fundamentalism, Religion, Science and tagged aldous huxley, charles darwin, creationism, erasmus darwin, karl marx, kent hovind, patriot bible university. Bookmark the permalink. Are you telling me The Flintstones aren’t real history?? NO!!!!!!!! Say it ain’t so, Fred!!!!! Whether Hovind also believes that Adam and Eve had wisecracking animals that served as household tools is not entirely clear. There are religious quacks just as there are science quacks. Both do nothing but cause confusion, spread dissension, perpetuate half-baked ideas and, often enough, outright lies. Both tend to be fundamentalist in outlook, unreasonable and closed-minded. And, sadly, both are allowed to dominate public discussion because controversy and stupidity sell. I can’t really think of any science quacks offhand, unless you mean people who support pseudoscience. Not saying there aren’t any, just that they don’t seem to be as significant. Well, not to start any divisive arguments, but in my mind’s eye, Dawkins and his ilk are about as quacking as they come, and their agenda is every bit as pernicious (and doomed to failure) as the religious extremists on the far right. What quackery do you feel Dawkins has promoted? “that amount to little more than mocking religious people. Richard Dawkins, a famous biologist and atheist, is an honorary officer of a group that sells Bible Warning Labels to raise funds so it can file lawsuits… With people like Dawkins and Christopher Hitchens as two of the most well-known atheists in the Western world, it is easy to conclude that atheists have a serious disdain for all religious people (the majority of the world) rather than a mere difference in belief, think they are serious intellectuals and smarter than “childish” religious people because they reject a power higher than themselves, and spend an enormous amount of time researching, writing, and degrading a God they do not believe in. Looking in from the outside, it seems atheists are working overtime to justify their personal beliefs to a highly skeptical audience. This is not the best public relations campaign… Organized atheism only exists to promote a single belief. Religious organizations promote a single belief and an important worldview including the duty to help the poor and persecuted even if they do not share our religious belief or happen to be atheists themselves.” (http://www.patheos.com/blogs/friendlyatheist/). What Dawkins, Hitchens and the New Atheist movement do is a serious disservice to science, which cannot be co-opted to serve an ideology. But under their lead, science has been denigrated into scientism, which is the failed philosophy of logical positivism, resurrected to bolster Darwinian materialism as a kind of proof of atheism. Scientism, however, negates science, which as properly defined by actual scientists, such as those in the university of Indiana (http://www.indiana.edu/~ensiweb/lessons/unt.s.is.html), is “a process by which we try to understand how the natural world works and how it came to be that way… there is no certainty in science, only degrees of probability (likelihood), and potential for change. Scientific understanding can always be challenged, and even changed, with new ways of observing, and with different interpretations. The same is true of scientific facts. New tools and techniques have resulted in new observations, sometimes forcing revision of what had been taken as fact in the past. Therefore, unlike mathematics, and contrary to popular perception, in science nothing is ever proven (in the sense of finality or certainty that the word suggests).” Science has limitations. Scientism denigrates legitimate science because it denies and negates those facts. It doesn’t allow for scientific understanding to be challenged, but turns what is currently interpreted by some (e.g., the hypothesis of macro-evolution) into unquestionable dogma; it takes the “scientific method” and turns it into a magical determiner of facts; it also misunderstands how the scientific method actually works, and how fallable it can be, based as it is on human observation and interpretation. This false-version of science has been trumpeted by its purveyors as the new authority in matters of Truth, a replacement for the ignorant religious views and institutions of old. And yet it operates the same way in that it has gatekeepers and spokespersons who dominate the discussion and silence those who would question the status quo (and this is something that can be backed up with numerous quotes from scientists in various fields who’ve witnessed this firsthand). Then as now, people don’t question authority figures, and accept blindly what the authority tells them is true. It’s still fundamentalism only in a modern guise, and it’s just as pernicious as religious fundamentalism. And the fact that what Dawkins and Hitchens is preaching IS a philosophy “could” qualify it as a kind of alternate religion (when that word is used in its broadest sense as a way of looking at life and the world around us). Well, that turned out longer than I intended! Anyway, it’s an interesting subject (when its kept from degenerating into an argument, which unfortunately, happens too often in public and online debate). I read The God Delusion and I didn’t find it angry. Whether that’s because I agreed with much of it, I don’t know. I did, however, find that the thesis that Darwinian evolution can be used to disprove God wasn’t particularly sound. That is, I think evolution is real and God isn’t, but I don’t think one is the RESULT of the other. This goes in the other direction as well, which is part of why the Creationist attempt to tear down evolution is rather ridiculous. Still, Dawkins usually comes across as pretty likeable to me (unlike Hitchens, who could be funny at times, but also seemed to be a bit of a jerk). While he may be promoting a humanist/materialist philosophy, I haven’t seen any indication from him that he insists everyone else has to adhere to it, which tends to be part of fundamentalism. The bit about Bible Warning Labels isn’t something I’m familiar with, and I can’t really get the gist of it from the little bit you quoted. I also find the statement about “a power higher than themselves” to be somewhat misleading; theism doesn’t just say there are powers greater than us (that much is obvious; the human body is pretty darned fragile), but that at least some of these powers are conscious and sentient. And the complaint about atheists spending “an enormous amount of time researching, writing, and degrading a God they do not believe in” obviously isn’t going to hold a lot of water to someone like me; much of my blog is dedicated to discussing things that aren’t real. Whether the scientific community is resistant to challenges to the status quo isn’t something I can really speak to, although with human nature the way it is, I wouldn’t be too surprised. I wouldn’t categorize evolution as part of that, though; that’s a field that’s constantly changing. Hypotheses regarding macro-evolution do change in regards to the mechanics of it, but at its foundation, it’s still based on the Darwinian model of things morphing from lesser to greater. Challenging that model is what gets the dyed-in-the-wool, “there is absolutely no supernatural entity” scientists in a froth, which is why sites like http://www.dissentfromdarwin.org/ exist, demonstrating that there are no small number of legitimate scientists who think that evolution is little more than a house of cards propped up on the back of a sacred cow. Where’s this “lesser to greater” idea coming from? The Darwinian theory doesn’t make such value judgments. There are philosophies that do, and while their ideas can be called “evolution” in a sense, they aren’t scientific. It’s like how Social Darwinism really has nothing to do with Darwin. True. I didn’t mean it that way, though. I simply meant “Lesser,” as in less complex. “Greater” as in more complex. Although that doesn’t really fly either, does it, since some of the smallest organisms are extremely complex. Let’s then just say it’s the idea of “molecules to man” postulatation of organisms evolving from sea creatures to amphibians and reptiles to mammals and man. This is the essence of the Darwinian model which is seen as science-fiction to some, and the absolute truth to others.